A business opportunity with a US-based partner prompted Perley Beairsto, 68, and his nephew, Les Falconer, to form Nova Scotia Fisherman, a company that makes natural skin care products infused with local sea kelp. The duo were already manufacturing products for private labels such as Kiss My Face Cosmetics, Ritz Carleton Hotels, Fairmount Hotels and Old Navy. Beairsto and his nephew persuaded their American partner to let them develop and sell a particular candle in New Minas, Nova Scotia. “We can put some local people to work and we can develop the product here. So that’s what started it,” Beairsto explained. However, Beairsto and his nephew knew developing one product to export wouldn’t be enough to sustain a business in the long term. They wanted to create employment for people in the Annapolis Valley area. The duo approached the Community Business Development Corporation (CBDC) for financing to set up Nova Scotia Fisherman in New Minas. “We needed some help with growing the inventory and growing the company,” Beairsto explained. “They were very helpful in several different aspects of the setting up of the funding of the business,” he added. 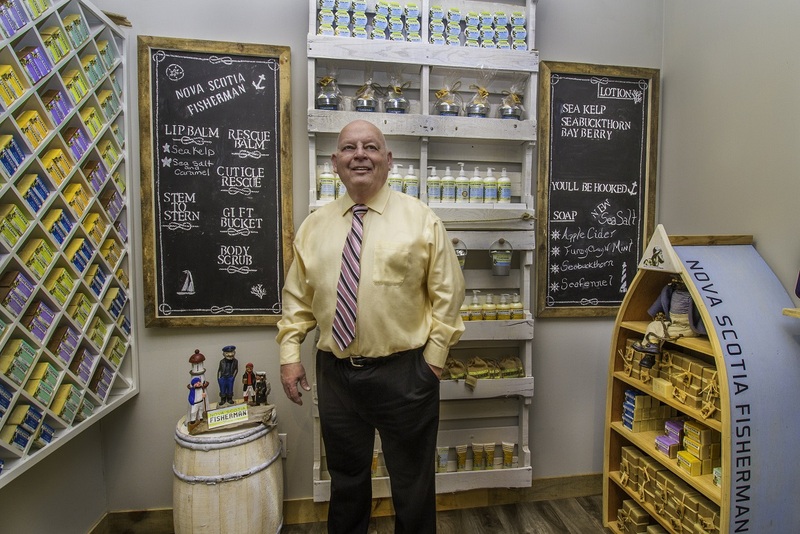 With the financing and assistance, Beairsto and Falconer were able to grow their business to include making other skin care products such as homemade soap, lip balm, a cuticle cream and a skin care lotion for people with extremely dry or cracked skin. “We manufacture everything we make here in New Minas and employ local people,” Beairsto said. All of products with the Nova Scotia Fisherman label are made with essential oils and local sea kelp. “We use as many local products as we can in the ingredients,” Beairsto explained. Since launching Nova Scotia, the company has grown from two employees to ten. Beairsto says the company exports its products to all provinces in Canada and overseas to the United Kingdom, South Korea, Japan and Australia. The company has been selling its projects in the northeastern United States for the past year and a half, Beairsto explains. Nova Scotia Fisherman products are also being sold at Vitamin Cottage, a 110-stores chain in the midwestern United States.